Tourism, garment, food and beverages, metal manufactures, herbs. Nepal has used a series of five-year plans in an attempt to make progress in economic development. 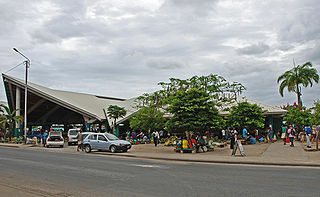 It completed its ninth economic development plan in 2002; its currency has been made convertible, and 17 state enterprises have been privatised. Foreign aid to Nepal accounts for more than half of the development budget. Government priorities over the years have been the development of transportation and communication facilities, agriculture, and industry. Since 1975, improved government administration and rural development efforts have been emphasised. Agriculture remains Nepal's principal economic activity, employing about 65% of the population and providing 31.7% of GDP. Only about 20% of the total area is cultivable; another 40.7% is forested (i.e., covered by shrubs, pastureland and forest); most of the rest is mountainous. Fruits and vegetables (apples, pears, tomatoes, various salads, peach, nectarine, potatoes), as well as rice and wheat are the main food crops. The lowland Terai region produces an agricultural surplus, part of which supplies the food-deficient hill areas. GDP is heavily dependent on remittances (9.1%) of foreign workers. Subsequently, economic development in social services and infrastructure in Nepal has not made dramatic progress. A countrywide primary education system is under development, and Tribhuvan University has several campuses. Although eradication efforts continue, malaria had been controlled in the fertile but previously uninhabitable Terai region in the south. Kathmandu is linked to India and nearby hill regions by road and an expanding highway network. The capital was almost out of fuel and transport of supplies caused by a crippling general strike in southern Nepal on 17 February 2008. The Cost of Living Index in Nepal is comparatively lower than many countries but not the least. The quality of life has declined to much less desirous value in recent years. Nepal was ranked 54th worst of 81 ranked countries (those with GHI > 5.0) on the Global Hunger Index in 2011, between Cambodia and Togo. Nepal's current score of 19.5 is better than in 2010 (20.0) and much improved than its score of 27.5 in 1990. Huge numbers of Small Foreign Investments come to Nepal via the Non Resident Nepali, who are investing in shopping malls, plazas, real estate, tourism, etc. Nepal has a huge capacity for hydroelectricity. Accordingly, a large number of foreign companies are in line, but political instability has stopped the process at the same time as it's growing on its own. Nepal has entered into agreements for avoidance of double taxation (all in credit method) with 10 countries (PSRD) since 2000. Similarly, it has Investment protection agreements with 5 countries (PSRD) since 1983. In 2014, Nepal restricted the Foreign aid by setting a minimum limit for foreign grants, soft and commercial loans from its development partners. Nepal's merchandise trade balance has improved somewhat since 2000 with the growth of the carpet and garment industries. In the fiscal year 2000-2001, exports posted a greater increase (14%) than imports (4.5%), helping bring the trade deficit down by 4% from the previous year to $749 million. Recently, the European Union has become the largest buyer of ready-made garments; fruits and vegetables (mostly apples, pears, tomatoes, various salads, peach, nectarine, potatoes, rice) from Nepal. Exports to the EU accounted for 46.13 percent of the country’s garment exports. The annual monsoon rain, or lack of it, strongly influences economic growth. From 1996 to 1999, real GDP growth averaged less than 4%. The growth rate recovered in 1999, rising to 6% before slipping slightly in 2001 to 5.5%. Strong export performance, including earnings from tourism, and external aid have helped improve the overall balance of payments and increase international reserves. Nepal receives substantial amounts of external assistance from the United Kingdom, the United States, Japan, Germany, and the Scandinavian countries. Several multilateral organisations such as the World Bank, the Asian Development Bank, and the UN Development Programme also provide assistance. In June 1998, Nepal submitted its memorandum on a foreign trade regime to the World Trade Organization and in May 2000 began direct negotiations on its accession. Tourists trekking in Annapurna region in western Nepal. Tourism plays a vital role in Nepal's economy. Progress has been made in exploiting Nepal's natural resources, tourism and hydroelectricity. With eight of the world's 10 highest mountain peaks, including Mount Everest at 8,848 m. In the early 1990s, one large public sector project and a number of private projects were planned; some have been completed. The most significant private sector financed hydroelectric projects currently in operation are the Khimti Khola (60 MW) and the Bhote Koshi Project (36 MW).The project is still undergoing and has dependency on China, India and Japan to take the further steps. Nepal has 83,000 MW of theoretical and 42,133 MW of technically/financially viable hydroelectric potential, however the total installed capacity, at present, is mere 730.47 MW. The environmental impact of Nepal's hydroelectric Own calendar (Bikram Sambat) New year in mid- April projects has been limited by the fact that most are "run-of-the-river" with only one storage project undertaken to date. The largest hydroelectric plant under consideration is the West Seti (750 MW) storage project dedicated to exports to be built by the private sector. Negotiations with India for a power purchase agreement have been underway for several years, but agreement on pricing and financing remains a problem. Currently demand for electricity is increasing at 8-10% a year whereas Nepal's option to have agreement with India will make this fulfilment against demand. The development of hydroelectric power projects also cause some tension with local indigenous groups, recently[when?] empowered by Nepal's ratification of ILO Convention 169. This is a chart of trend of gross domestic product of Nepal at market prices estimated by the International Monetary Fund and EconStats with figures in millions of Nepali Rupees. (PPP) 6.02 Bln. 9.86 Bln. 14.39 Bln. 20.90 Bln. 28.75 Bln. 38.45 Bln. 40.97 Bln. 43.49 Bln. 47.05 Bln. 49.56 Bln. 52.58 Bln. 55.50 Bln. 59.23 Bln. 62.67 Bln. 67.62 Bln. 70.62 Bln. 71.82 Bln. 78.59 Bln. ^ "World Bank forecasts for Nepal, June 2018 (p. 153)" (PDF). World Bank. Retrieved 6 September 2018. ^ "Ease of Doing Business in Nepal". Doingbusiness.org. Retrieved 27 January 2017. ^ "Export Partners of Nepal". CIA World Factbook. 2015. Retrieved 26 July 2016. ^ "Import Partners of Nepal". CIA World Factbook. 2015. Retrieved 26 July 2016. ^ Kathmandu nearly out of fuel, Nepal says. CNN. 17 February 2008. Retrieved 2008-04-13. ^ Cost of Living Index in Nepal - Statistics & Graphs of Nepalese Citizen's Economic Power. Retrieved 10 January 2014. ^ IFPRI/ Concern/ Welthungerhilfe: 2011 Global Hunger Index The challenge of hunger: Taming price spikes and excessive food price volatility. Bonn, Washington D. C., Dublin. October 2011. ^ "Nepal puts a minimum amount limit on foreign aid and loans". IANS. news.biharprabha.com. Retrieved 3 July 2014. ^ "EU as Nepal's largest exporter". ktm2day. Retrieved 11 October 2011. ^ "A Conversation with Departing Nepal Chief of the UK Aid Agency". United We Blog! for a Democratic Nepal. 15 June 2013. Retrieved 16 May 2015. ^ "Nepali Political parties criticize Indian Hydel Power proposal". IANS. news.biharprabha.com. Retrieved 20 July 2014. ^ "Report for Selected Countries and Subjects". Retrieved 30 August 2018.